Entries tagged with “Fruit and Vegetable”. Check out this huge cauliflower! We’ll be traveling and not get to enjoy our veggies very much, which is sad because there are some great ones. We’ll also miss next week’s. We definitely didn’t finish eating all of the greens from last week. Again I’ve never heard of some of these items – Chard? Amaranth? We’ve been enjoying the strawberries that we got over the weekend. I even made my first ever jam (and it looks like it might turn out!!) with CSA strawberries and rhubarb. It is delicious. I’ll write more about it later. 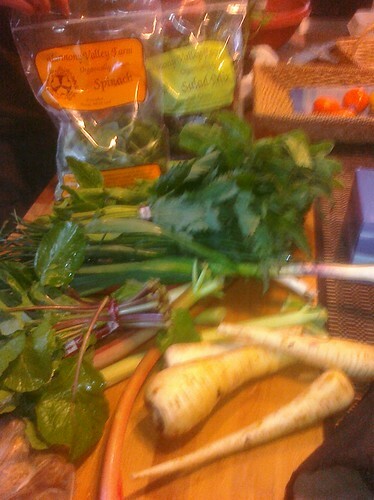 As our weeks ebb and flow with busyness so does the about of CSA food we are able to eat. Adventures and Thoughts of Team Cross is powered by	WordPress 4.3.19 and delivered to you in 0.355 seconds using 36 queries.